The advent of the Internet changed retail forever, though that fact was not immediately apparent in the early days. In the mid 1990s, when the Internet was in its infancy, very few retailers saw the potential of this new medium. J.W. Pepper, however, has a history of exploring new business technologies and decided to explore the emerging medium. more to connect with one another from across the United States. At a time when internet forums were in their infancy, Pepper was using them to foster peer-to-peer cooperation between people who otherwise might never have met. 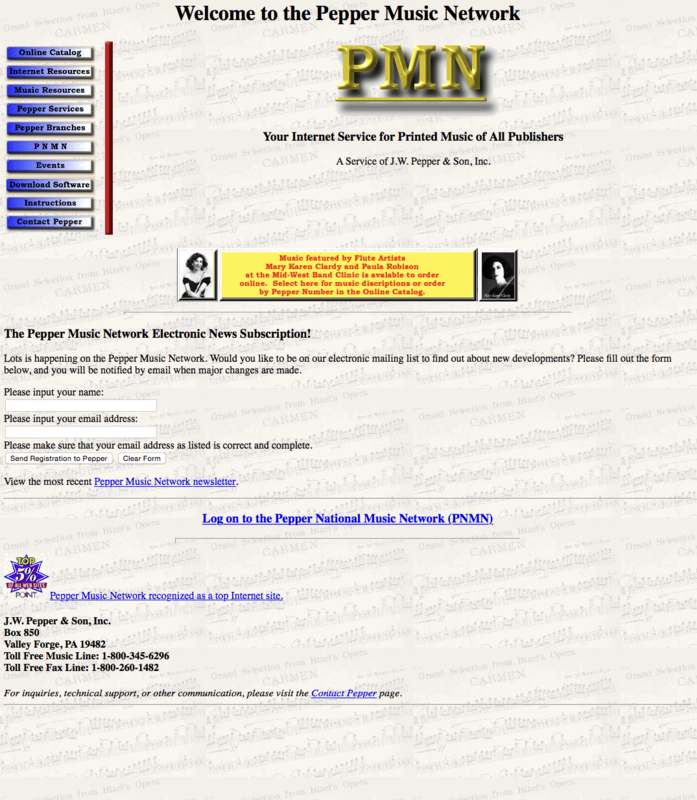 An online catalog was also included on the original website, allowing customers to browse our inventory. Even in those early days, customers could view and listen to many of the pieces Pepper had to offer. It was not long before online ordering made up a significant portion of our company’s sales. At the same time corporations like Amazon were changing the way we think about retail, Pepper was already making great strides toward bringing the American marketplace into the internet age. As of 2015, about 60% of all orders taken by J.W. Pepper come through the website. Through the years, Pepper’s website has become the main source for innovation in the company. 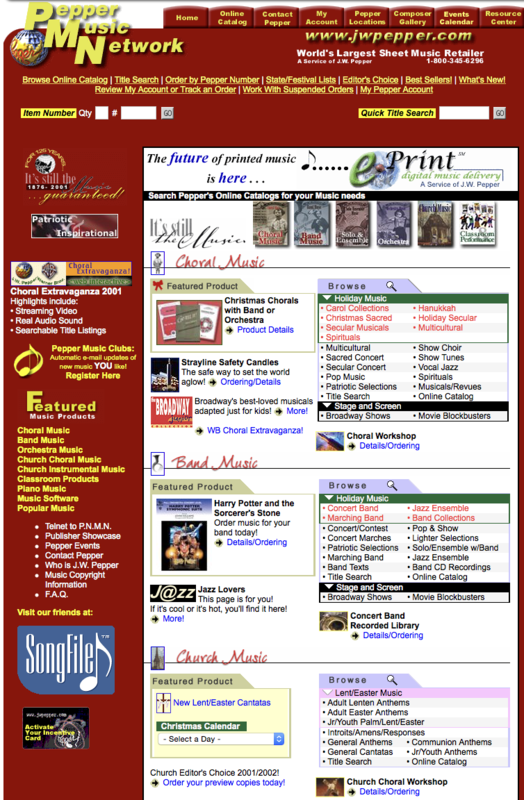 In 2001, Pepper introduced ePrint, which allows customers to find the music they want and print it in their own home, classroom, or office. The Pepper website has also greatly impacted existing aspects of the business. 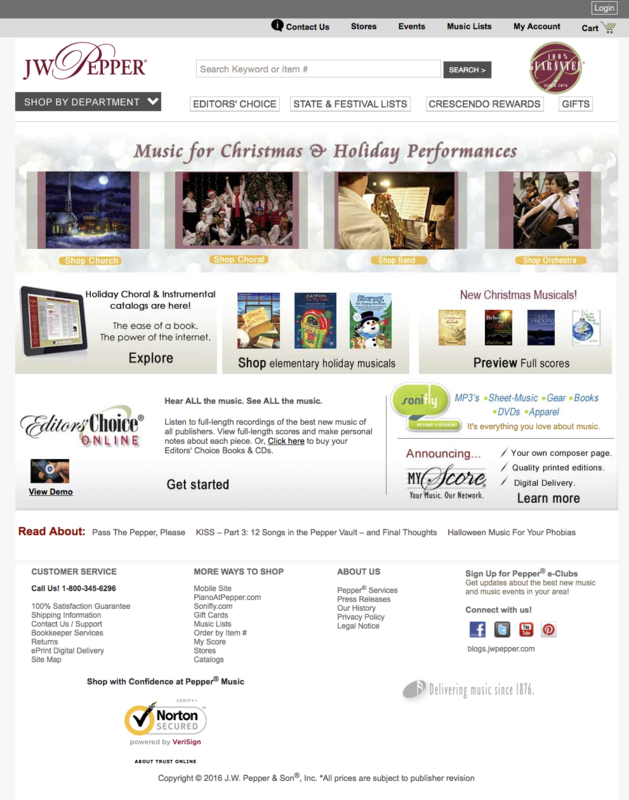 Editors’ Choice, which replaced the earlier Choral Experience, evolved from printed booklets and CDs to a largely online feature. Of course, Editors’ Choice has a story all its own. I have inherited an unusual amount of vintage sheet music that I have no need for. Can you direct me to an agency that may be interested in purchasing some or all of it? Hi Phyllis, if any of it is published by Pepper, we may be interested in it. If not, I would suggest either eBay or an antique dealer. Thank you for contacting us.